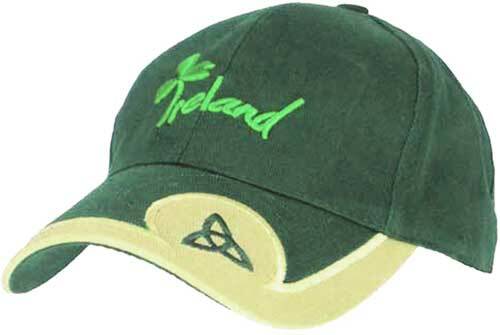 This Irish cap also has the word IRELAND embroidered on the size adjustment strap. This Celtic cap features an embroidered Kelly green Ireland and shamrock design. The bottle green Irish cap with Kelly green accents and beige trim is also enhanced by an embroidered Trinity knot on the brim. The Trinity knot cap is 100% cotton and has a Velcro strap for size adjustment; the one size will fit most adults. This Irish cap is received with Celtic knot and shamrock history cards, complements of The Irish Gift House.